Orbiter Captures Curiosity's "Crime Scene"
Looking down on Curiosity's landing site from on high, a high-resolution camera on NASA's Mars Reconnaissance Orbiter has spotted crash sites with several pieces of the spacecraft that accompanied the rover to the floor of Gale crater. There was a time when Martian landers made their dramatic passage through the planet's thin atmosphere and onto its bleak surface completely in isolation. No one back on Earth would know the landing's outcome until the spacecraft "phoned home." But no longer. When NASA's Phoenix descended toward its polar landing zone in May 2008, NASA's Mars Reconnaissance Orbiter was waiting overhead to capture the dramatic descent of the capsule and its parachute. 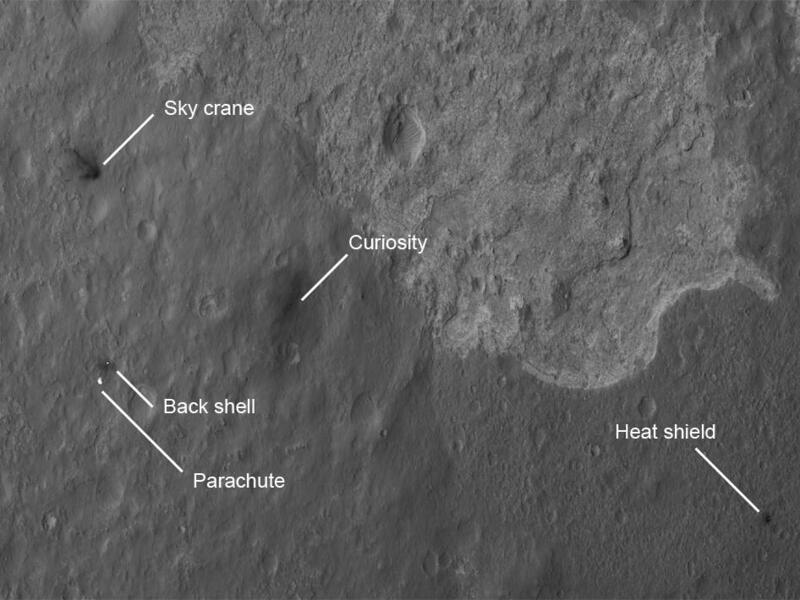 An image taken looking down from orbit on Curiosity's landing site reveals not only the spacecraft but also its parachute, both halves of the protective shell that surrounded it, and the rocket-powered "sky crane" that lowered it to the surface. Note the three distinct terrain types in the rover's vicinity. Click on the image for a larger version.